The Eurovision fan clubs from the UK and Germany invite you to the third Eurovision Weekend in Berlin! Gala with Eurovision Stars from both countries, parties, karaoke and lots more…fans and friends are very welcome to the third annual Eurovision Weekend. 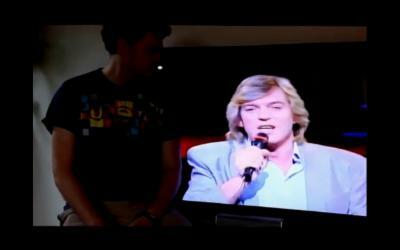 Our first Eurovision artist was announced by our partner fan club OGAE UK: Scott Fitzgerald, who came second in Eurovision 1988 (beaten by only points by Celine Dion) will be representing the UK in this year's Eurovision Weekend. The German artist is three-time participant in the German preselection, winning twice and being runner-uo once, Corinna May. The third artist ist this year's fan favourit Suzy, she will sing for us, she will dance for us and celebrate a huge party with all the fans. Tickets can be purchased as a package for 36 € and comprise the whole weekend including the Gala, the parties, the brunch and the touristic programme. Fans from the UK can book their tickets directly from OGAE UK and transfer a corresponding sum to the accounts of OGAE UK. Tickets for the singular events will be available at the box office at 5 € (Welcome Party on Friday), 30 € (Gala plus Party on Saturday), 5 € (only Party on Saturday) and 5 € for the Sunday brunch (can only be booked until the Welcome Party on Friday evening). The reunions and the sightseeing on Saturday and Sunday are free of charge. For the Eurovision Weekend our partner hotel Ramada-Alexanderplatz offers a special rate. Find more information on fan accomodation in the special offer of our partner hotel, all detailed information for fans can be found here . It's a limited contingent valid only until June, so get your tickets, accomodation and make sure to join us in July. There’s also a (limited) opportunity of private accommodation, in case you would like to make use of this offer, please contact jose@eurovision-weekend.de. You are interested in preparing and helping to make the Eurovision Weekend a success ? You are very welcome, there are regular meetings with all the helping hands, please contact one of the team members or write to Frank (frank@eurovision-weekend.de).